HOUSTON -- Darius Anderson rushed for 246 yards and scored two touchdowns and Richmond George Ranch dominated a battle of first-time finalists with a 56-0 win over Mansfield Lake Ridge in the Class 5A Division I championship game Friday night. 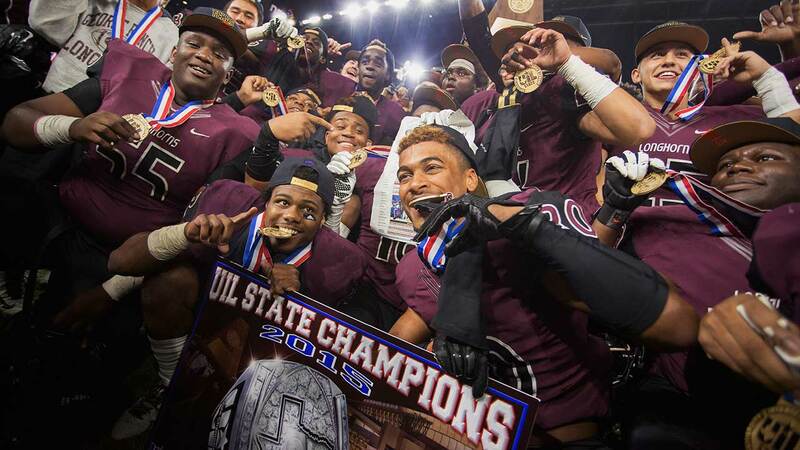 Anderson's fourth 200-yard rushing game in the playoffs included a 40-yard run for a touchdown and a 41-yard catch for a score in the first state title in any sport for George Ranch (16-0). It was largest margin of victory in championship game since Dallas Highland Park beat Marshall 59-0 for the 4A Division I title in 2005. Josh Scruggs had 108 yards and a touchdown on eight carries, and Alex Fontenot rushed for three touchdowns. Quarterback Jett Duffey of Lake Ridge (15-1) left the game in the third quarter after injuring a hamstring in last week's semifinal victory against Aledo.